Anti-inflammatory drugs such as dexamethasone can have harmful side effects on the skin, bones and metabolism. Structural biology research from Emory University School of Medicine has implications for the long-standing quest to separate these drugs' benefits from their side effects. GR can bind DNA in two modes. At some sites, it pairs up or "dimerizes" – turning genes on. At others, it binds one at a time, turning genes off. For GR-targeting drugs, the side effects are thought to come from turning on genes involved in processes such as metabolism and bone growth, while the desired anti-inflammatory effects result mainly from turning inflammatory and immune system genes off. In their new paper, Eric Ortlund, PhD, and colleagues report that GR's ability to directly bind DNA extends more broadly than previously appreciated. The first author is Will Hudson, PhD, previously a graduate student with Ortlund and now a postdoctoral fellow in Rafi Ahmed's lab at Emory Vaccine Center. 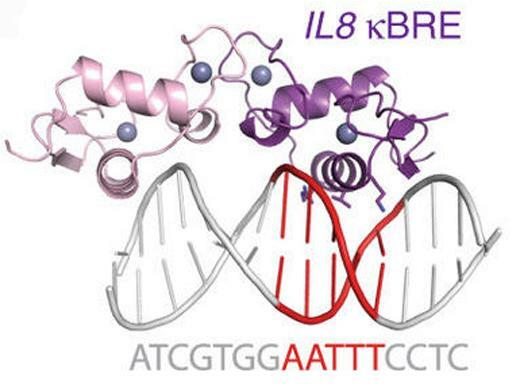 GR was known to interfere with another important family of DNA-binding proteins, master regulators of inflammation, which are together called NFkB. Ortlund's team found that GR can directly bind one at a time to many of the same stretches of DNA that NFkB interacts with. "This type of interaction, where GR is acting one at a time – we think it's druggable," says Ortlund, who is associate professor of biochemistry at Emory University School of Medicine. He adds that the paper's findings could lead to the reinterpretation of several studies in the field of inflammatory gene regulation. GR was previously proposed to interact with NFkB sites by "tethering," based on protein-protein interactions.